Man, I'm so happy it's almost Friday! I'm not saying this week has been bad, but I'm really looking forward to a 3 day weekend. The last 3 day weekend I had was when I went to that wedding in Vermont, and then I was traveling the whole time so it didn't really feel like a vacation. Right now I don't have any big plans, and that's ok with me. I haven't been to the movies in a long time so maybe we'll do that. Do you have any plans? Hallelujah, an indie brand that doesn't just have glitter topcoats! I really wanted polishes that show the base color and glitter, just like what Hare Polish is known for. And I can't say enough how much I love the little rabbit labels on the bottles. Cosmo Blossoms is a lilac base with lots of medium and micro green glitter. It was a little bit of a pain to take off, but the application and formula was great. The only downside is the price, and it can range from around $10-$13, depending on where you buy it. To find out how to purchase her polishes, check out the Hare Polish Facebook page. This is more like it! I wish the box had more polishes like Sienna, and not the frosty chromes. I'm usually drawn to silver polishes over gold, but I still like this one. Sienna is a gold metallic color that had no problems with streaks. It sort of reminds me of polishes that companies release around Christmas though. Oh well, it's still best of the August Maven Box. Hi everyone! Sorry for the extremely late post, but I was at a friend's house playing some games (Cards Against Humanity and Mansions of Madness). I received so many compliments on my nails tonight which made me extremely happy. I find the best compliment to get as a blogger is when people ask if your nails are real and I just happened to be asked that tonight. I guess I'm doing some things right! Anyway, we have another polish that is a streaky mess called Harley. The picture actually hides some of the flaws, but you get the idea. I'm just...not a fan of this. I knew these were going to be some streaky polishes, which is why I didn't want to buy this Maven box. I now make sure I unsubscribe the box in time if I'm not interested in it. As a thank you to all customers with Zoya.com accounts**, we made a special Back to School BOGO (Buy 1 Get 1 Free) offer just for you! Your personalized BOGO code can be found in the "My Account" Section of www.zoya.com under the "My Coupons & Promo Codes" section. In case you were wondering... YES Free Shipping is available! Read below for more details. 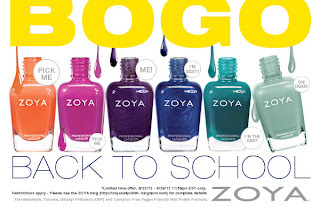 To celebrate back to school season, Buy ANY One Zoya Nail Polish (0.5oz) and Get One FREE* 8/22/12- 8/28/12 11:59pm ET. This special offer is up to 8 bottles total (buy 4 get 4 free). *Offer open only to those with active accounts** on Zoya.com, artofbeauty.com, Qtica.com and qticasmartspa.com as of 8/22/2012 at 12 PM EDT. Consumer orders only. Online promotion only. Continental US ONLY. BOGO offer good for up to 8 polishes. BOGO Offer* code is unique and non-transferable. One code per account. Code expires on 8/28/2012 at 11:59PM EDT. If volume is higher than expected, please allow up to 4 weeks for shipping and processing. Comments, videos and pictures posted about this Zoya.com BOGO Offer* outside of Zoya.com or zoyanailpolish.blogger.com are not representative of the opinions of Zoya Nail Polish, Art of Beauty, Inc., Qtica and Qtica Smart Spa and we do not confirm the accuracy of any postings. **qualifying accounts are those with a valid username (email) and password that has been created and used in the last 3 years account must be made by 8/22/2012 at 12PM EST to qualify for the BOGO Offer. No purchase necessary to start an account. Customers are responsible for maintaining active accounts. If username or password have been lost we (Art of Beauty, Inc.) are not responsible for restoring accounts or giving out any account information. Happy Hump Day! Speaking of, hump day reminds me of a conversation I had this weekend. Way back in the day, my mom worked at this restaurant called Happy Humpty, and she mentioned it to my husband and he cracked up. The fact that a chain restaurant had this name was quite weird to us! Anyway, today we have a bit of a wild card on our hands. Tangerine Dreamz is the final polish of the Gelato Mio collection and it's a bit brighter than the rest of the collection. It is an orange creme that is slightly lighter than my photos show. I really enjoyed this one since it is so different compared to the other oranges out this summer. The big issue I have with it is the name. Seriously, why did they have to add that stupid z to the end of dream? Ugh! That is a huge pet peeve of mine. Happy (?) Monday! I'm sad that the weekend is over, but we had a good time looking at houses the other day. There are 2 that we really like, but we are leaning toward one at the moment. Are we going to pull the trigger, who knows (of course we'd get a home inspection first). We watched Holmes on Homes last night on HGTV and this one woman didn't get an inspection for this extremely old house. I mean, come on, who doesn't get an inspection these days? Do you have any suggestions for first time (potential) homebuyers? Ah yes, we've finally come to the very light blue pastel creme called Barely Blueberry. This is quite the appropriate name since there is so much white in this one. I thought it'd end up a bit chalky, but I had no issues with opacity in 2 coats. It's nice and I always like a nice light blue color. How are you? Things are fine here, and I've been having a good time with my parents here. Today we're going to be looking at a couple of houses with a realtor. My husband and I have been wanting a house for awhile, but the timing just wasn't right. We'll see how that goes. Today I have Strawberry Shake from the Gelato Mio collection, which is a light pink pastel creme. It almost has that Pepto Bismol color to it and it had a slightly thick application in 2 coats. I like it, but it's not a very unique color. TGIF! I'm in a pretty good mood; my mom is at home cooking me my favorite meal and I am finished with work for the week! I've had a few hiccups in some of my science this week (grr, why can't science work when I want it to?! ), but that will only make my weekend nicer. Oh yellow polishes, how I love and hate you. Yellow is not a color most people wear, so when I do, I get tons of comments on it. The only downside is that the formula is usually pretty crappy. Tonight I have an unusual yellow called Banana Peel which is a soft yellow without being too pastel and washed out. Overall, I like it, but it's not my favorite yellow or even my favorite of the collection. The formula was above average for a yellow; it was a little thick and streaky, but not too much of a hassle. It's going to be a busy weekend for me since I have my family coming into town. I tell you, I've been so busy most weekends this summer! Hopefully next weekend will be relaxing because a girl needs her beauty sleep! Yay, another Pahlish glitter topcoat to show called Great Wide Open. If you like glitter, this one is for you, because it's got all shapes and sizes (and color) of glitter for your viewing pleasure. I found it was one of those glitters that needs to be dabbed because it will just slide right off otherwise. Pahlish can be found on Etsy, and currently several of her colors are available right now if you are interested. Happy Friday! Oh wait, I just wish it was Friday :-( The days are always long when you're working out in the middle of hot fields. I am getting quite the tan, despite wearing SPF 40. Boyz 'n Berry is my favorite color of the Gelato Mio collection, for sure! It's a light turquoise creme that is heavy on the blue. The first thing I thought when I saw this was, "This looks like For Audrey from China Glaze!" I haven't really done any comparison between them, but they are at least in the same ballpark color-wise. I have always been fond of For Audrey because my name just happens to be Audrey (just in case any of you didn't know that). The application and formula was pretty awesome, and just needed the 2 coats for full opacity. I understand that indie nail brands aren't for everyone; some people don't want to stalk a site to maybe get a polish or 2. 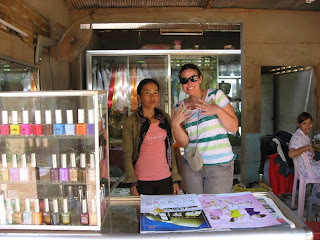 I happen to enjoy the thrill of the chase and was able to get a few mini polishes from Dollish Polish. Up first is The Many Shades of Mr. Grey which is full of multi-sized grey glitter with a sprinkling of black glitter in a clear base. I was hoping this one would have a bit more black glitter in it, but it's still a nice glitter topcoat. I was very impressed how this applied since I didn't have to dab it on. It was very smooth and I could use regular strokes to apply this one. Oh, and doing this reminded me how much I love Zoya's Kelly! Oh, and I have not read 50 Shades of Grey, nor do I plan to. TGIF! I am leaving for Washington DC tonight (for the world's largest pen show! ), so this is going to be a quick post. When I saw Flowers on the Highway from Happy Hands, I knew I had to have it. It is chock full of glitter (large yellow and silver, medium silver, pink and green, and small black and pink glitter) that I ended up putting over Orly's You're Blushing. When I say it was full of glitter, I'm serious; it almost applies too much per coat! I found it was best to dab on, unless you want to deal with pushing glitter around. I love this one! You can find it on their Etsy site every Saturday at 5 PM EST. Finally, a California beach I've actually been to! When I was in high school, my band played in the Rose Parade so I was able to go see Manhattan Beach while there. Since it was January, it was not really warm and it was pretty windy, but it was still fun. Have you been to any of the beaches named after the American Apparel sheer polishes? Manhattan Beach is a bright coral jelly with a jelly sandwich using Dollish Polish Koopa King on my middle finger. This jelly was pretty opaque, and you can't really see a lot of the golden glitter, just the black and dark green glitter from Koopa King. No worries, I'll have another post featuring Dollish Polish soon. I think this one may be my favorite of the three, likely because it is slightly more opaque while still having that squishy look to it. Overall, if you like jelly polishes, I would definitely pick one or 2 of these up. p.s. isn't it weird seeing my right hand posted instead of my left hand?